The government shutdown was fun for approximately no one, and we're sure approximately everyone is relieved that it's over. But while that shitshow is technically finished, its repercussions will be far longer lasting, particularly at one of the most beloved parks in America. 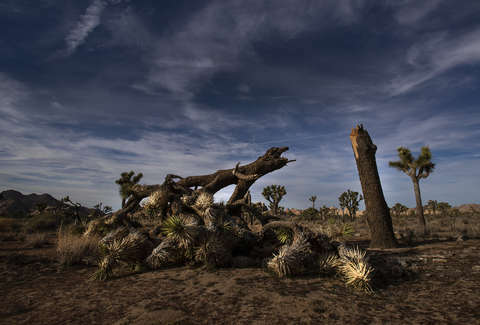 Experts are now saying Joshua Tree National Park may take up to 300 years to recover from the shutdown. The New York Times reports that the park maintained just a handful of workers, which meant vandals and bad guests had the run of the place: driving off-road, toppling gates and posts, and even destroying some of the Joshua trees. Some seem to have been chopped down, and others were driven over. On top of this, the park has a sensitive ecosystem, and the garbage that was strewn around could upset it. At a rally for the park reported on by The Desert Sun, former park superintendent Curt Sauer lamented: “What’s happened to our park in the last 34 days is irreparable for the next 200 to 300 years."